Package on Package (PoP) applications are growing in popularity for mobile and handheld professional electronics applications and, with it, placing further demands on assembly engineers. In simple terms PoP represents the stacking of components one on top of another either during the original component manufacture or during printed board assembly. As real estate is at a premium for logic and memory, PCB designers say the only way to go is up and up. 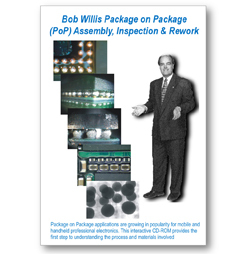 PoP packaging systems may include direct soldering, wire bonding or conductive adhesives for device to device interconnection. PoP is new to many contract and OEM assembly staff but with the demands of paste dipping, reflow warpage, increased placement accuracy and Z height control, process introduction can be demanding. The difficulty in multi level ball inspection can be a challenge for x-ray equipment procedures as level one balls can mask level two and three interconnections. Manual inspection can be used but with these applications space is often not available for side viewing.